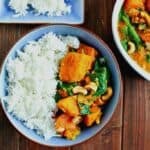 Vegan Sweet Potato Curry made with warm spices, creamy coconut and crunchy cashews - make this a really worthwhile dinner. Served with basmati rice, or just in a bowl on its own, this hits all the right spots! Put cardamom, peppercorns, cumin, coriander, mustard seeds and chilli flakes in a dry frying pan over medium heat. Cook, stirring for 3 minutes. Remove from heat. Spoon spices and turmeric into a spice grinder (or mortar and pestle) and grind to a powder. Add oil and saute the onion until it softens, and add garlic and ginger. Cook, stirring for 2 minutes. Add sweet potato and toss in spice mixture. Add coconut milk and stock and bring to the boil. Reduce heat and simmer, partially covered, for 12 to 15 minutes or until sweet potato is tender. Heat your Veetee Dine In Basmati Rice in the microwave according to package directions. Just before serving, add spinach and cashews and toss for 1 minute.